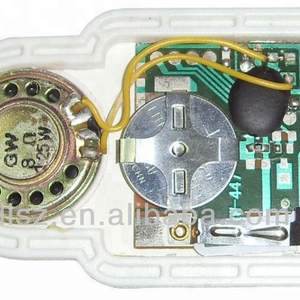 Our company especially in researching and developing many proposals of voice IC chip product. 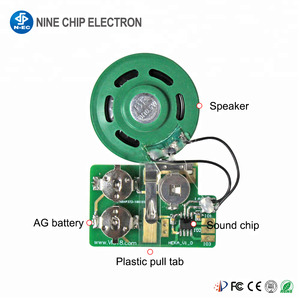 IC chip and MP3 music module series have applied for the nation invention patent. our professional sales team provides clients the best idea and suggestion and assistant you with our best. 2. 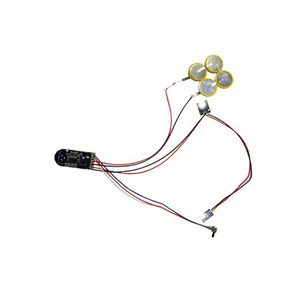 Light sensor greeting card music chip / light operated sound module for greeting card Functions: plays music, voice, message, phrase or any sound 3. 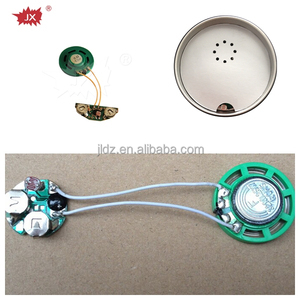 Light sensor greeting card music chip / light operated sound module for greeting card Activated way: pressing, buttons, light sensor, vibration sensor, shadow sensor or rocking switch. competitive price for you Packaging & Shipping Net weight: 13g/Carton Gross weight: 13.8g/Car on PCS/Carton: 1000PCS Packing way: OPP bag, inner carton, outside carton Carton size: 51*28*32CM Delivery way: DHL,FEDEX door to door service, by air or sea etc Q:What should we provide9 Light sensor greeting card music chip / light operated sound module for greeting card R:You should send us your music file in wav/mp3 file,and tell us what's function you need for IC. 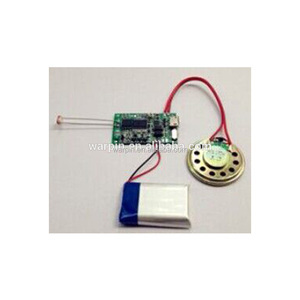 Q:Is there any message or music file we can use for the Light sensor greeting card music chip / light operated sound module for greeting card R:Yes,we can customize any music/message as per your request. If you come from Hongkong, it will take 1 hour by flight (every day 1 flight around noon time). By Train: if you come from Guagnzhou,we may advise you to by high spee train to our shenzhen location. 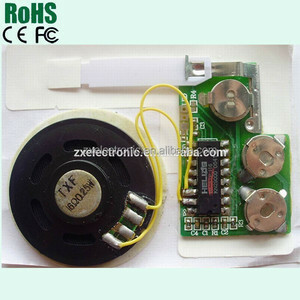 Quality We have more than 12 years experiences in quality control and make Zero tolerance of . 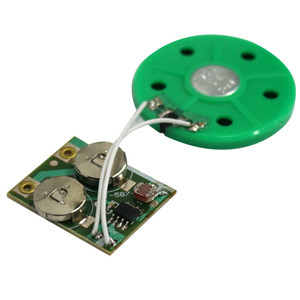 Voice recording musical chip An easy-to-use recordable chip voice module With speaker, microphone and button High quality and competitive price, with CE/ROHS/EN71-1/2/3 approved! 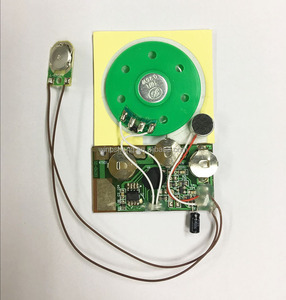 Support mp3,WAV and more Record your own message Use in printed projects, invitations, greeting cards, craft projects, scrapbooks, electronic projects and more 2 -buttons and different recordings supported Batteries can be replaced and message retained OEM/ODM is OK! 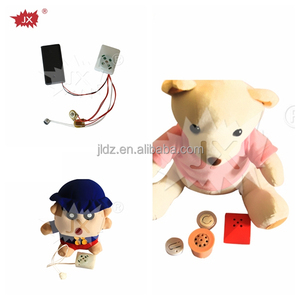 Specifications Product name Voice recording musical chip Use in Plush toys, scrapbooks, and other craft projects Activation Push button,light sensor or other Messages Voice,music and sound are available Music Comfat Mp3 or WAV Power supply 3 pcs AG10 button cell batteries. 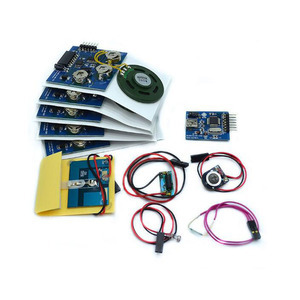 Is an OEM/ODM manufacturerintegrating product development, production and sales,we are specializing in design and production of consumer electronic products and modules. 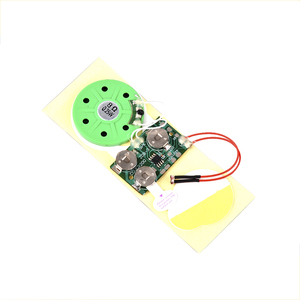 Precise: We send a detailed order as well as a proof showing your custom items and how they will appear when printed. Responsible: The order will be produced exactly according to the order details and proof which you approved; if not, we&rsquo;ll rerun your order, issue a credit, or refund you money. 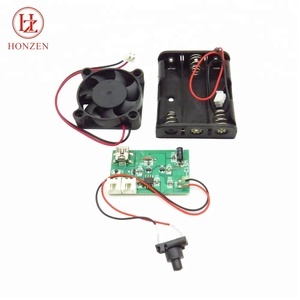 Q:Is there any message or music file we can use for the Motion sensor sound module /light sensor music chip R:Yes,we can customize any music/message as per your request. 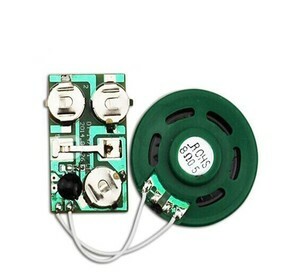 Q:What's the recording time that we can make9 we suggest the lenght can within 60s,as more longer,more expensive. Q:What's the price9 R:The price will base on your music,so please prepare your wanted music,and send to us,we will give you a exact price.